SAN DIEGO–Arts District Liberty Station continues to be a destination for art from both sides of the border. The photographic exhibition “El Universal, 100 Years in the Life of Mexico and the World” will be presented at the Arts District beginning August 28. The exhibit celebrates the centennial of El Universal’s founding as a nationally circulated newspaper of Mexico. The exhibit features large photographs and reprints of front page stories of the events that have affected our lives during this period. “We’re very happy to cross borders now in San Diego as the first stop of our California Tour, with an exhibition that features the most important national and international events recorded over the last hundred years,” affirms Enrique Bustamante, President of the Ealy Ortiz Foundation. 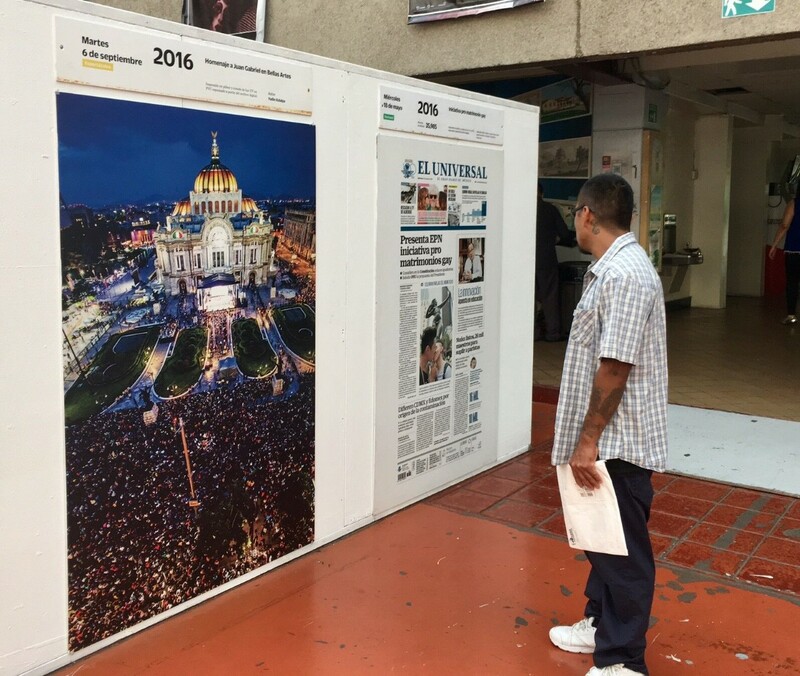 The exhibition displays the historic front pages of the famed “Gran Diario” or Grand Daily Newspaper of Mexico, which are currently being exhibited at Tijuana City Hall’s Central Patio. The San Diego exhibit will include nearly 50 panels on display in the “Arcade of the Arts Visitors can begin at the Liberty Public Market and take a walk through history as they travel through the Barracks arcade in the Arts District. “The Arts District welcomes this historic exhibition to our campus and we look forward to having visitors from both sides of the border,” said NTC Foundation Executive Director Alan Ziter. “The collaboration with the Mexican Consulate, Tijuana Innovadora and El Universal continues to establish the ARTS DISTRICT as in international destination for art and history.” For the past three years, the Arts District has been host to the Latin American Arts Festival, drawing nearly 10,000 visitors annually to the Point Loma campus. The exhibition will feature the first edition of the paper, published October 1, 1916, which informed of the reestablishment of the judicial system in the Republic of Mexico, following resolutions dealing with the Mexican Revolution’s rebel groups. Other front pages will be exhibited report the passing of famed Mexican singer and film icon Pedro Infante, the Second World War, Charles Lindbergh’s arrival in Mexico, the first man on the moon, World Trade Center, and other events that have left their mark on the world. An inaugural ceremony will take place August 28 at 4:30 p.m. at Arts District Liberty Station (Barracks 14), 2770 Historic Decatur Rd. in San Diego. The ceremony will be followed by a roundtable discussion of “The Importance of the Mexico-U.S. Relationship; the Cali-Baja Megaregion Success Story, an Example for the Rest of the World.” The event will be headed by the Executive President and Chair of the Board of Directors of El Universal newspaper, Juan Francisco Ealy Ortiz, Jose Galicot Behar, Tijuana Innovadora, Rafael Fernandez de Castro, UCSD, hosted by the Mexican Consul General in San Diego, Marcela Celorio, with the participation of business executives and governmental officials from both sides of the border. The exhibition has already been displayed in premises of the Mexico City Metro subway, the grounds outside the Mexican Senate, and also at the Autonomous University of Hidalgo and Mexico’s Pan-American University. The exhibition runs from August 28 to September 28. It will then move on to San Francisco, where it will be presented within the framework of the Scientific Journalism Workshop organized each year by El Universal. The exhibit arcade is open to the public 24 hours a day.